History will be made as horse racing takes place for the first time in the UK on Good Friday - at Lingfield in Surrey and Scottish track Musselburgh. 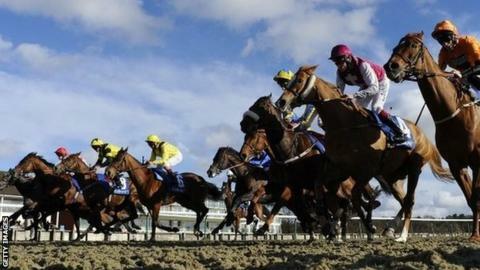 Lingfield's finale to a new all-weather racing championships boasts a total of £1m in prize money for seven races. Track officials expect a crowd of over 7,000, with Musselburgh set to welcome 4,000 racegoers. Officials at Lingfield say they have sold 6,000 advance tickets for the historic first Good Friday racing fixture with minimal marketing. Traffic from the nearby M25 to the Surrey track is described as heavy. The level of attendance both here and at the other GF fixture at Musselburgh is seen as a key gauge of their success. A carnival atmosphere with music and entertainers has greeted punters - some of whom were queuing nearly three hours before gates opened - and the winner's circle has been relocated to a position in front of the stands. Prize money totalling £1m is available for the seven races on Lingfield's Polytrack artificial surface on what is being styled as All-weather Championships Finals day. "It's catching people's imagination," said Kate Hills, spokeswoman for Lingfield owners Arena Racing. Grandeur, the mount of three-time champion jockey Ryan Moore for trainer Jeremy Noseda, and Ed Vaughan's Winter Derby winner Robin Hoods Bay head the field for the concluding Easter Classic. Musselburgh, which also stages racing on Sunday, switches its Saturday card to Friday and hopes to host a three-day Easter weekend festival in the future. While there have been murmurs of opposition on religious grounds, the move to introduce meetings on one of the few blank days in the racing calendar has been broadly welcomed by trainers and owners. "Maybe people have accepted it will happen. I'm all for giving people choice," Musselburgh general manager Bill Farnsworth told BBC Sport. "I think there was a bigger reaction when Sunday racing was introduced some years ago." Some riders initially expressed concerns about losing time off, but the British Horseracing Authority has introduced a four-day break for jump jockeys after the climax of their season on 26 April. Organisers of two racing charity open days, at Lambourn in Berkshire and Middleham, North Yorkshire, were also worried about a clash. Hills said two large television screens, which will show the Lingfield action, were being loaned to both events and a £10,000 donation made to each. "One of the reasons we are having racing on Good Friday is it's a day of leisure and people are looking for something to do," she said. At Lingfield, there were 96 horses declared for the fixture, with maximum fields for five of the seven contests. Farnsworth hopes a future three-day meeting at Musselburgh, just outside Edinburgh, could feature a mix of both racing codes on the Friday and Saturday. He said: "It would be good to have a Flat race involving Flat and jump jockeys, and you could also have a hurdles race involving both. They are all good horsemen and you could have a bit of fun with it." Friday sees the popular veteran racehorse Borderlescott come out of retirement to run in a race named after him. "He's a great northern sprinter who was retired and we asked the owners if they would parade him," said Farnsworth. "They said he was fit and have entered him to run at the age of 12. He would be a very popular winner."